"Of all the creatures in the vastness of the Universe, there is none like me. I was present at the birth of the Universe, and I shall be there at its end. Though I ravage worlds to live, I bear no malice toward any living thing. I simply do what I must to survive. And why must Galactus survive? For, no matter how many worlds I devour ... How many civilizations I destroy ... It is my destiny to one day give back to the Universe  Infinitely more than I have ever taken from it. So speaks Galactus!" Galactus is a Marvel Comics character created by Stan Lee and Jack Kirby. He first appeared in Fantastic Four #48 (March, 1966). Sole survivor of the universe existing before the Big Bang, Galactus is perhaps the most feared being in the cosmos. Untold billions of years ago, he was born the humanoid Galan on the planet Taa, a wondrous paradise of scientific and social achievement. However, his universe was in its final stages, with all matter plunging towards a central point via the "Big Crunch", collapsing into a new "Cosmic Egg", a sphere of disorganized, compact primordial matter. Galan, a space explorer, discovered a radiation plague threatening all of Taa. Though he was initially scoffed at, the truth became clear as the people of surrounding planets perished. Despite the efforts of Taa's greatest scientists, no cure could be found, and the population began to die off. Galan convinced the handful of remaining survivors to die gloriously by flying a starship into the blazing cosmic cauldron. The others were killed by the intense radiation, but Galan was filled with new energy and saved by the sentience of the dying universe. The sentient energy spoke to Galan as it brought him into the egg. With the next Big Bang, the Cosmic Egg matter exploded outwards, eventually condensing into stars and planets. The future Galactus and his starship were re-created simultaneously with the embodiments of Eternity and Death, though he drifted inert for billions of years while new life began to populate the universe. The starship crashed on an unnamed planet, where Ecce The Watcher saw its occupant emerge as raw energy. Ecce recognized the danger the nascent being would pose and could have destroyed him then, but instead chose to abide by his oath of non-interference. Launching his ship back into space, the being ejected its lifeless companions into the void, there to drift in endless flight. He then created a suit of armor to harness and regulate his awesome energies, and transformed his ship into an incubation chamber, where he spent countless centuries evolving into his current form. Eventually his craft again fell into orbit around a verdant planet, Archeopia. The advanced natives scanned the craft, detected its awesome energies, and wisely left it undisturbed. Galactus threatened to devour the planet Zenn-La, but was persuaded by native Norrin Radd to spare it in exchange for becoming a new herald. Galactus transformed Radd into the Silver Surfer, suppressing his morals so that he would lead Galactus to inhabited worlds when necessary, such as a symbiote-ruled planet, and the Kree planet Tarsis. The Surfer once even led Galactus into ending the threat of the murderous warlord Kallreich the Unconquerable by consuming a world he had invaded. When the Silver Surfer brought Galactus to Earth, despite the efforts of Uatu The Watcher to hide the planet, Alicia Masters reached Norrin's long-submerged emotions, convincing him to turn against his master. Galactus had easily overpowered the Fantastic Four, but the Surfer's power delayed Galactus' meal long enough for Reed Richards to present him with his first defeat. Uatu sent the Human Torch to Galactus' worldship to retrieve the Ultimate Nullifier, a device allegedly having the power to destroy even mighty Galactus; Reed used it to force him to spare Earth, but Galactus punished the Surfer for his betrayal by trapping him on Earth. Soon after, Galactus sensed abundant energy sources within the enigmatic Black Galaxy, but Galactus was distracted when Dr. Doom usurped the Silver Surfer's power and crashed into Galactus' barrier; sensing this disturbance, Galactus scanned Doom, but found him beneath his notice and sent him back to Latveria. Galactus soon sent his Punishers to retrieve the Surfer from Earth; the Fantastic Four held it off long enough for the Surfer to escape into the microverse. Galactus forced them to help him find the Surfer, who located an uninhabited planet for him, after which he left the Surfer trapped on Earth for easy future location. Galactus had a daughter, Galacta, who suffers from the same hunger issues that he has, but chooses to prevent the destruction of most forms of life by instead consuming malevolent sources that would end up destroying life if left unchecked. The All-New, All-Different Marvel era has been a time of great change for Galactus. The new The Ultimates, an all-star team dedicated to solving cosmic problems, picked him for their first mission. They tracked down his old incubation chamber and forced him back into it, "evolving" him into a new, golden form. This "Lifebringer" Galactus, who restores desolate worlds, became one of the team's central allies throughout the book's entire run. It's all a bit ironic, considering his rampage through the Ultimate Marvel universe ended up destroying the original Ultimates. Note, by the way, that the Ultimate universe had his own one, Gah Lak Tus (for tropes about this one, see here). The Coming of Galactus - Also known as "The Galactus Trilogy"
The Ultimate Galactus Trilogy, composed by the miniseries Ultimate Nightmare, Ultimate Secret, and Ultimate Extinction; (though the Ultimate version's proper name is "Gah Lak Tus"). The Ultimate Vision miniseries spun off from this also has to do with Gah Lak Tus. Hunger - A four issue limited series in which Galactus finds himself in Marvel's Ultimate Universe following the massive tears in the time space continuum at the conclusion of Age of Ultron and merges with Gah Lak Tus. Cataclysm: The Ultimates' Last Stand - A Crisis Crossover and the immediate sequel to Hunger. The story sees the various heroes of the Ultimate line (The Ultimates, Miles Morales, and the X-Men) banding together to stop Galactus from consuming their world. The Unbeatable Squirrel Girl - Issues 1-4 involves Marvel's ultimate bad guy vs. the Unbeatable Squirrel Girl. Only she can face him because he's stealthed, but didn't deign to stealth himself from squirrels! The Ultimates (2015) - The first two issues see his transformation into the Lifebringer. He then becomes a main figure in the book's Myth Arc, aiding both the team and Eternity himself in the war against a mysterious threat to the entire multiverse. In the 1996/97 Crossover/Merger of Amalgam Universe, Galactus was merged with Brainiac as "Galactiac". Silver Surfer: Galactus makes a cameo appearance in the 1990 video game, sending the Silver Surfer to the Magik Domain to collect the Cosmic Device. Marvel Ultimate Alliance: Galactus is the boss of the "Skrull Planet" level. The Silver Surfer appears to fight alongside the heroes, dishing out the damage while the player characters activate three consoles that will overload Galactus's machines. Marvel Super Hero Squad: The Infinity Gauntlet: Galactus is the boss of Episode 8: Taste of a Throneworld. Marvel vs. Capcom 3: The final boss of the game, Galactus takes up the entire right side of the screen. In order to reach this fight, the player characters must defeat two randomly-selected "Heralds": silver versions of some of the game's playable villain characters. Ultimate Marvel vs. Capcom 3: Same deal, except there's now an unlockable mode where you play as Galactus. Lego Marvel Superheroes: Galactus is the game's Big Bad, and also an unlockable character upon completing the game. Sadly, He's only playable as a minifigure, smaller even than Big Figure characters like the Hulk. He doesn't see himself as good or evil, just a predator doing what he has to do to survive. In a way, this is true due to him being Inherent in the System. In the end, he is more a cataclysm than an actual villain and cannot be judged by human moral standards. Reed Richards even gave this a great deal of thought during the first Secret War storyline, musing about how odd it was that the Beyonder considered Galactus "evil" and grouped him in with all the other villains. Reed knew that Galactus was so far beyond good or evil that the concepts simply didn't apply. He regarded Galactus as a force of nature, comparable to an earthquake or a hurricane, which also cannot be judged as good or evil. Adaptation Name Change: The Ultimate Marvel universe reimagination is called "Gah Lak Tus". Advancing Boss of Doom: Type B in Marvel Ultimate Alliance. The heroes must run from Galactus as he destroys the platform behind them with each step. Eventually ends in a Pivotal Boss fight. A Form You Are Comfortable With: Beings of different planets perceive Galactus differently, as seen here . Ego the Living Planet: You are but a simple being! I am an entire world! Galactus: Your words are true. But in all of Space, I stand alone! I am Galactus...the be-all and end-all of the Universe. A God I Am Not: Although he's pretty egotistical, Galactus does not consider himself godlike. He has criticized the mortal belief that power makes you one. "Sphinx! You share the folly of all your lowly species. You believe that power itself makes one a God! But even Galactus, to whom all is possible, even Galactus whose every passing whim becomes reality — even Galactus is no God." Always a Bigger Fish: Many galactic threats, like (regular) Thanos or the Supreme Intelligence of the Kree, quail at the thought of direct confrontation with Galactus. But Galactus is not at the very top of the power spectrum either: he has been stomped by the Beyonder in the original Secret Wars, defeated in a DC/Marvel crossover by Krona, and conquered by the Chaos King in Chaos Wars. Subverted when he is confronted by Master Order and Lord Chaos after his reversion at the hands of the Ultimates. 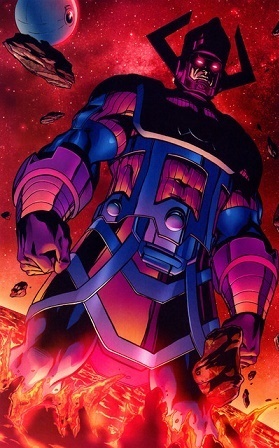 Thanos with the Infinity Gauntlet rated either of them individually well above Galactus, but now that he has fused with his Ultimate counterpart and been reversed (which removes his hunger, not to mention directly conflicts with order and chaos' fundamental existence), he not only defies them, but subjects them to this trope. In The Hunger, The Source warned Highfather that Galactus was coming, so Highfather hid New Genesis, which, unlike Apokolips, would make a tasty treat for Galactus. Arch-Enemy: Has been a contender for this to the Silver Surfer. Attack Drone: What Gah Lak Tus becomes after it merges with Galactus in Hunger. Back from the Dead: Galactus was actually killed once in the Marvel-616 universe. Unfortunately for the many mortals who cheered this event, it was soon revealed that Galactus' existence was denying a certain Multiversal Conqueror access to their universe. The Fantastic Four had no choice but to restore Galactus to life. Badass Baritone: In the 90s Fantastic Four cartoon where he's voiced by Tony Jay. Badass Boast: Galactus may be a bombastic gloater, but he produces some truly imposing boasts. Beam Spam: One of his attacks in Marvel vs. Capcom 3. Galactus fires energy beams from his eyes and all ten of his fingers, filling the screen with a barrage of unavoidable firepower. All the player can do is block and suffer massive chip damage. Big Bad: He sometimes takes this role either to the Silver Surfer or in a Marvel crisis crossover. Blue and Orange Morality: Depending on the Writer. In Kirby's original story, Galactus was outright stated to be beyond good and evil and incapable of being judged by any human morality system. He more resembles a natural disaster than a man. During the Secret Wars event, when the Beyonder transported a group of heroes and villains to a distant planet to battle each other, Galactus was placed among the villains. Reed Richards found this to be completely incomprehensible, stating that Galactus was a force of nature and was no more capable of having enemies than a hurricane or an earthquake. Galactus completely ignored the rules that the Beyonder tried to impose on him, choosing instead to try to drain the planet of all its energy in order to challenge the Beyonder, whom he claimed had the power to end his all-consuming hunger. Breakout Villain: He started out as just another threat from space: nowadays he rates just behind Doctor Doom as Marvel's most famous villain. Broke Your Arm Punching Out Cthulhu: In his fight with the Mad Celestials, he took all of them at once and actually killed one. Unfortunately this only caused them to see how much of a threat he was and merge together. Brought to You by the Letter "S": Depending on the Artist he often has a clear letter G on his chest. Going back to his first appearance. Cannot Tell a Lie: And it's because he never needs to. Captain Ersatz: Another multi-universal devourer of worlds: Unicron the Dark God, the Chaos Bringer. When the Transformers' Marvel Comics series retooled Unicron's being and backstory, the similarities between Galactus and Unicron were so great that Unicron is often seen as the Transformers version of Galactus, right down to You Cannot Grasp the True Form. Unsurprisingly, this has led to many fanworks and fanwanks about a Galactus vs. Unicron showdown and their squabbling over worlds to devour. As far as motives go however, they couldn't be more different. Unlike Galactus, Unicron doesn't even need to eat worlds and only does it out of sheer hatred, which itself can be seen as a parallel to the 1610's Galactus. Also, Galactus has to absorb biospheric energy from planets. Unicron literally just eats them and consumes their mass. Casual Interstellar Travel: Although he can teleport, he usually utilizes Cool Ships to cross the universe. Catch-Phrase: "I hunger". Usually at the end of a Badass Boast, like so ◊. Combat Compliment: Usually only in the face of incredible power, like when he got hit by Darkseid's Omega Beams. Galactus: Your power is great, master of Apokolips. But if in this you think you see a weakness in Galactus, you see no weakness but your own. Complete Immortality: Well, he can be killed by more powerful cosmic entities as well as the Ultimate Nullifier, but basically true so long as he remembers to eat. Cool Helmet: Galactus' helmet is easily his most recognizable feature. In Fantastic Four: Rise of the Silver Surfer, the cloud entity called Galactus takes on a familiar shape once the Silver Surfer reaches its center. The helmet itself becomes a prized possession of MODOK in his Marvel vs. Capcom 3 ending. His daughter Galacta also has a helmet modeled after his. Par for the course for Jack Kirby, of course. His helmet is not unlike many of the helmets the New Gods wear. Cool Starship: The Taa II, a ship the size of a solar system. Cosmic Entity: One of the fundamental forces of the universe. Unfortunately, the most likely of them to visit an Insignificant Little Blue Planet. Curb-Stomp Battle: Most of his fights have him dishing this out to the point where it's easier to list exceptions. When he's subjected to The Worf Effect he ends on the receiving end of it. Defeat Means Friendship: After the combined forces of the Fantastic Four, The Avengers and Doctor Strange prevent a starving Galactus from destroying the Earth, Reed Richards shows the Devourer of Worlds mercy. In exchange, Galactus calls Richards "friend" before vowing that Earth need no longer fear his hunger. Deflector Shields: Galactus can erect near-impenetrable energy shields. De-Power: Reed Richards once built a weapon that stripped Galactus of the Power Cosmic, turning him back into the mortal Galan for a time. Destroyer Deity: Although he isn't actually a god, Galactus is this in the Marvel Universe. He regularly destroys entire planets while consuming their Life Energy as food. Tasked with finding a way to save Taa, Galan piloted his ship into the heart of a Big Crunch singularity as a last resort. Galan would not stop, surviving radiation that killed not only his shipmates, but most of the life in the universe. Eventually, Galan gets the attention of the Sentience of the Universe, who gives rebirth to Galan as Galactus, and bids farewell to him when sent away into the new universe. Galan became this again after being depowered. Initially considering his merging with the Power Cosmic as it seeks him out to be inevitable, he became inspired after seeing the people around him struggling against the inevitable to survive. He used the Four's teleportation technology to warp to another dimension in an attempt to escape the Power Cosmic. Galan knew it would find him again sooner or later, but he realized he had to try. Doomed Hometown: The planet Taa, Galan's home prior to becoming Galactus. And the entire previous universe it was a part of; Galen fused with its consciousness as it was dying at the end of the last Big Crunch/Big Bang cycle to become Galactus. The Dragon: His Heralds play this role. The Dreaded: He's known feared across the universe. He once frightened off an armada of aliens planning to attack Earth by threatening to destroy the homeworld of whoever attacked first. All of them ran away with their tails between their legs. The completely stupid, silly and awful name of Alberto El Hambriento (Alberto the hungry) was given to Galactus by the now defunt Novaro editorial for a time. Quite difficult to take a planet-eater seriously with that name. The Mexican dub of the Hannah-Barbera cartoon of the The Fantastic Four named him Marte (Mars) for some unexplained reason. Still better than Alberto. The Latin American dub of the Silver Surfer cartoon named him "Galaxius", possibly to combine better with "galaxy", we are not sure. We repeat, still better than Alberto. Earth-Shattering Kaboom: In the comics, the battle between Galactus and Tyrant is said to destroy entire galaxies before its conclusion. In Marvel vs. Capcom 3, Galactus destroys Earth if the player loses the final battle. Eldritch Abomination: A Cosmic Entity who needs to feed on energy of planets to survive, and is capable of feeding the energy from anything from stars to pocket universes. Enemy Mine: During The Infinity Gauntlet, Galactus teamed up with Adam Warlock and other cosmic heroes to challenge Thanos. Later, Galactus worked with The God Squad to protect his food supply, not for the greater good. Even Evil Has Standards: Some regard Galactus as A Lighter Shade of Black. His survival preserves the universe from greater harm: he does what he must to survive and can rightly be considered a higher being. He always keeps his word, pays his debts, and is willing to leave sentient beings alone or escape doomed planets as long as they don't bother him. He tends to show disgust at those who cause meaningless destruction like Tyrant and the Fallen One. And if it's one of his own that's causing it, he'll usually do something about it when someone brings it to his attention. On the other hand, he also tried to kill every sentient being on Counter-Earth out of self-stated spite, simply because they had succeeded in killing a future version of himself in self-defense, which renders much of the above claims of his nobility and lack of pettiness null and void. In addition, it has been established that he can just as easily feed on stars or non-sentient cosmic energy sources instead of wiping out trillions of sentient beings, yet only rarely does he seek out such sources. When he confronted Darkseid in a Marvel/DC crossover, he became outraged at Darkseid for the massive waste of life, throwing his Parademons and troops at Galactus knowing they didn't stand a chance and knowing that there was no life force on Apokolips for Galactus to feed on. He's mollified by Darkseid stating that he did it because it's in his nature - Galactus nods and states that he and Darkseid are Not So Different: both are slaves to their basest drives. Galactus also has no love for Cyborg Superman either. Once he got to the Ultimate Marvel universe and was confronted by its version of the Vision, he was disgusted and outright called the Darker and Edgier universe broken. Even More Omnipotent: Whenever the Silver Surfer rebels, Galactus just No Sells all of his attacks. Or when any being he bequeathed with the Power Cosmic tries the same - it's surprisingly common. Galactus is able to take back their powers at will or override any actions they attempt to take. Evil Is Bigger: They don't get much bigger than Galactus, who is approximately the size of a planet. Exact Words: Galactus is a Rules Lawyer and will honor the word of any pact he makes. In a wider sense, this applies to Galactus's unique diet of planets. Specifically speaking, he has to drain the "bioenergy," or life-sustaining capabilities, of worlds. But there doesn't have to be life on the planet at the time—it just has to be capable of someday supporting it. Writers will often use this to Hand Wave why the Fantastic Four are helping an entity that eats entire planets—the heroes specifically try to send him to uninhabited worlds for his meals. Eye Beams: One of Galactus's most deadly attacks. In Marvel Ultimate Alliance, Galactus immediately knocks down any player character who attempts to fly with these. The Faceless: He does have a face ◊, but he's far more recognizable with that helmet on. Fermi Paradox: Reed Richards's answer to this paradox is Planet Eater Galactus. Fluffy the Terrible: In Latin America, he was renamed Alberto El Hambriento (Literally Albert The Hungry). Foregone Conclusion: In-Universe. In The Hunger, Galactus tells Darkseid he knows Norrin Radd will someday regain his memory and turn on him, and that it'll be a difficult time for him. He isn't particularly upset about it, just knows it's going to happen and there's nothing he'll be able to do about it. Fusion Dance: Before anything else Galactus is arguably a fusion of the last universe's Eternity, maybe the equivalent of the Phoenix Force and the last known surviving mortal Galan of Taa. Galactus is sucked into the Ultimate Marvel Universe when Wolverine breaks reality during the Age of Ultron event, and is attacked by his counterpart Gah Lak Tus, which tries to eat and ends up fusing with him, creating an even more powerful and ravenous entity. There is also Galactiac from the Amalgam Universe when the Marvel universe fused with the DC universe, a fusion of Galactus and Brainiac. Glowing Eyes of Doom: Although he is sometimes depicted with Black Eyes of Crazy and/or Electronic Eyes. Green Lantern Ring: The Power Cosmic, as the name implies, can do just about anything. It's a lot more limited in the hands of other beings, who haven't had billions of years to perfect their technique. Hand Blast: Galactus can project powerful energy blasts from his hands capable of knocking Darkseid off his feet. HeelFace Turn: As the Life-bringer, he's cured of the Cosmic Hunger and no longer feeds on planets. As such he's now a force for good, and he won't go back to the old status quo without a fight. Holier Than Thou: Often displays this attitude. Justified in his case though, as he indeed is a natural part of the Cosmic Balance, in contrary to many self-proclaimed Gods. His mere existance also keeps Abraxas at bay, a far worse entity. Humanoid Abomination: As seen by humans. Other races see him... differently. See You Cannot Grasp the True Form. Squirrel Girl's sciurine sidekick, Tippy-Toe, sees him as an enormous squirrel. Hyper-Awareness: The Cosmic Awareness, which Galactus shares with his Heralds. After his life was saved by Reed Richards, he promised never to attack Earth again, a promise he's kept thus far. He's even come to the planet's defense. He also gave his word regarding sparing Zenn La in exchange for Norrin Rad's servitude as his herald. After the Surfer dies, Galactus vows that neither he nor anyone else will ever harm the planet. Inherent in the System: Not only does he serve as a force to fix the natural imbalance between Eternity and Death, but destroying him would result in unleashing a much more dangerous Multiversal Conqueror on the Universe. The Juggernaut: The best Marvel's heavy hitters can typically do is slow him down, not actually beat him. Advanced civilizations can't even do that. Most cosmic entities have stalemated him at best. Large Ham: One of the biggest in Marvel. His dialogue in written entirely in capitalized letters, and usually for very good reason. "I am Galactus— and I hunger!" Ham-to-Ham Combat: His fight with Mephisto, along with an evenly matched clash of power, the two equally hammed up the scenery in their verbal clash. Last of His Kind: Galactus is the sole survivor of a universe destroyed by the Big Bang. However, he recently conceived a daughter and she's pregnant. Life Energy: The life energy of planets is what keeps Galactus alive. Mind over Matter: Not often used, but he an throw planetoids with it. No-Sell: In a big way. Examples are innumerable, while exceptions can probably be counted on the fingers of one hand. Noble Demon: He will honor his word. Non-Standard Game Over: He delivers one in Marvel vs. Capcom 3 if he defeats you. End result: The worlds of Marvel and Capcom are destroyed. One-Hit KO: In Marvel vs. Capcom 3, Galactus will start using an instant knock-out attack when he's low on health. The only way to avoid it is to stun him before he can complete the long charge time for the attack. One-Track-Minded Hunger: Galactus himself. His hunger defines his character, and it's pretty much the only thing he ever does. Only Friend: Galactus' first post-Surfer Herald was the Xandarian Gabrial Lan, called the Air-Walker. He and Galactus became friends and Lan ended up sacrificing himself to buy a severely malnourished Galactus the time needed to escape from a race of aliens that might have been able to destroy him. Its been insinuated many times that Galactus regrets not being able to save Lan's life. Parental Abandonment: After creating Galacta and placing her on Earth, Galactus left for parts unknown to continue his own existence, with no intention of watching over how she developed. Galacta doesn't enjoy the fact that she's related to him. In fact she outright hates him because of what he does. However, in her greatest moment of need, Galactus shows Galacta that he still cares for her with what he would consider to be unconditional love by saving her from death by starvation. Pet the Dog: As mentioned above, he does care for his daughter. Saving her from starvation involved sacrificing some of his energy - which means making his own hunger even worse. All for her. Physical God: Most of Marvel's standard Physical Gods need to Zerg Rush him to stand half a chance. Planet Eater: Very likely the Trope Maker. Planet Spaceship: Taa II, the Worldship belonging to Galactus, and named after his ravaged homeland Taa, is the size of a solar system. Power Echoes: How adaptions portray his voice. The Ultimate Nullifier, which was once part of him and which he sealed away from himself because he feared it's power and destruction. There's also his own armor, which serves as a self-imposed Power Limiter. The power inside Galactus is so overwhelming that he needs the armor to control it, and if he were to ever remove it, he'd be consumed from within and turned into a small star. Powers Do the Fighting: Relies almost entirely on the Power Cosmic and rarely uses his hands when fighting. Psychic Powers: Has both Telepathy and Telekinesis powers. Professor X barely managed to rouse his attention in the Secret Wars, whereas Moondragon and Thanos almost managed to overcome him in Thanos' own series. Purple Prose: Galactus often speaks like this, especially during the Jack Kirby years or the Darkseid crossover. Reality Warper: Being a cosmic being, Galactus was able to recreate the entire planet Zen-La, including population, etc. in every detail. Redemption Promotion: Part of the attempts to avert him suffering The Worf Effect also had a break from the status quo and had him become the Life-bringer. As he's cured of the Cosmic Hunger, Galactus is even more powerful, and when confronted by Lord Chaos and Master Order try to force him back to his old self, both of whom were considered to be stronger than him before, he punched the teeth out of the latter. Reset Button: The one time we do see the Ultimate Nullifier used in the mainstream universe it erased its target, Abraxas, along with the entire multiverse, yet everything is recreated to before Galactus' death effectively undoing it all. Sci-Fi Writers Have No Sense of Scale: We are constantly told that Taa II (Galactus' worldship) is the size of a solar system. If so, no comic book artist has ever really done it justice. And how could they? Fitting it into a panel would shrink even Jupiter to invisibility by comparison. Sealed Inside a Person-Shaped Can: Galactus is the can holding Omnicidal Maniac Abraxas sealed; he's so incredibly hungry that he needs to eat planets because most of his energy is going to keeping Abraxas locked up, and, as bad as Galactus is, Abraxas is worse. In another sense, the Galactus armor itself is a can; Galactus is said to look differently to each race that perceives him, and outside of the armor he's basically a blob of energy. Size Shifter: His physical size directly reflects his own strength and power. A severely weakened Galactus will be relatively humanoid in size. Splash Panel: Dr. Strange explained it in Sergio Aragonés Massacres Marvel: "He has it in his contract. The first time he appears in a story, he has to get a full-page panel! He must have Mike Ovitz as his agent"
Strong as They Need to Be: In his case, as much he has eaten. When starving even normally far weaker beings can hurt him, and the Thing once knocked him out. When he is fed however, he is extremely formidable, being able to destroy several solar systems in a single attack, during his fight with Tyrant it was even said that entire galaxies were destroyed and it is generally accepted that a fully-fed Galactus is on par with Eternity. Between that, it varies depending on the story. Sufficiently Advanced Alien: Even taking into fact he was once a man who became an energy being, most of Galactus's power really comes from technology. His form is encased in a special suit and even his planet eating is done with machinery. He apparently doesn't need his toys but survival would be a lot more difficult for him without them. Basically, the Taa II (his ship) lets him travel without using his own power, and the extraction machines he uses to drain planets are more efficient than he is. Summon Bigger Fish: How he's typically used when he isn't used a villain. Summon to Hand: As an aspect of him Galactus could summon his Ultimate Nullifier out of Abraxas' hands. Why he never did that under any other circumstance is a mystery. The Heralds of Galactus receive a portion of the Power Cosmic while they serve, usually granting them access to power greater than the majority of most Earth-based heroes. To put it another way, in the Galactus/Darkseid crossover The Hunger, the Silver Surfer hit a severely weakened Galactus with a full-power blast. Galactus shrugged it off like it was nothing and proceeded to beat the Surfer down in the dirt. Up to Eleven when Galactus made Superman his Herald. Yes, a demigod superhero endowed with godlike cosmic power. Cyborg Superman wanted this power for his own, but Galactus immediately knew he was unfit. He did grant him "perfection" - unfortunately for Cyborg Superman, he used Exact Words and turned him into a brick of metal, a perfect alloy with no imperfections. Was on the receiving end of this when a Franklin Richards from the future empowered him as his Herald to combat the Mad Celestials. Superhero Sobriquets: The Devourer of Worlds, the World Eater, the Ravager of Planets, the God of Genocide etc. Super Strength: Virtually unlimited thanks to the Power Cosmic. Super Weight: Level 6, although where exactly depends on how well-sustained he is. Talk to the Fist: When Order and Chaos chastise him for going against his Devourer of Worlds to be the Life-bringer and that, sooner or later, he'll go back to being his previous role, Galactus responds by punching Order in the teeth. Teleportation: Galactus can teleport not only himself, but entire planets, such as Galador, if he chooses. Third-Person Person: Frequently refers to himself as "Galactus" mid-speech. This Was His True Form: Galactus is in truth an Energy Being who only looks like whatever mortal mind is currently observing him. This is often ignored in parallel universe and alternate timelines, where his death leaves static and physical remains in his iconic getup, but his first death in the mainstream universe lead to his body exploding into a second sun for the Shi'ar homeworld. Time Abyss: Older than the current universe by a slim margin. "The Last Galactus Story", which was never finished, and happens within an unofficial alternative future, states that his ultimate fate is to restart the universe with a new big bang. First, he gets dropped off in the Ultimate universe and fuses with his Earth-1610 version. Then,after the events of Secret Wars, the Ultimates "reversed" him ridding him of his hunger and turning him into a life-giver. This has upped his position in the cosmic foodchain a bit to boot. Trademark Favorite Food: Mmmm... Planets. Yummy, delicious, life-sustaining planets. Trapped in Another World: After Age of Ultron, he has found himself in the Ultimate Universe. Truly Single Parent: Galactus created Galacta spontaneously from the Power Cosmic within him. Unbeknownest to her, she had the same capacity, which has already triggered and created the "Tapeworm" that drives her hunger. Ultimate Universe: Is portrayed as a fleet of sentient ships called Gah-Lak-Tus in Earth 1610 who hate all organic life with a passion. Galactus himself merges with them after the events of Age of Ultron tore up reality. Uniqueness Decay: Jack Kirby never intended for Galactus to be used past the first story he appeared in. He objected to all the character background later given for Galactus as well as the characterization for Silver Surfer in later stories. He wanted Galactus and his herald to remain a mystery and felt that overexposure and excessive character development would undermine the character's effect. Given that there are so many "gods" and other cosmic entities in the Marvel Universe, not to mention ones that are explicitly world eaters as well, he was right. Only in recent years have writers attempted to restore Galactus position in the grand scheme of things, and even then Galactus will always be more of a character than a true mysterious force of nature as he was intended to be. Unskilled, but Strong: He is extremely powerful, but his fighting skill is average at best. This is noted in his official power ratings, which lists every stat as 7 except for fighting skill, which is listed as a 2. Was Once a Man: Before merging with the Power Cosmic. Weapon of Mass Destruction: During Annihilation, Annihilus planned to turn Galactus into a cosmic bomb capable of destroying all life in the universe and the Negative Zone. Annihilus was able to capture Galactus because he'd acquired the aid of two of the oldest cosmic beings, each individually almost as powerful as Galactus is. The Worf Effect: Being a very recognizable, incredibly powerful character, Galactus has a tendency to be the one to suffer in order to establish that the new cosmic bad guy is a serious threat. Amazingly (and refreshingly) subverted when, after an entire storyline of beating established characters like Thor, Hulk, and the Silver Surfer, Red Hulk was dismissively one-shotted by him. Superman / Fantastic Four: The Infinite Destruction had Galactus making Superman his Herald. His hold wasn't as strong as it was on others, however. Worf Had the Flu: Often handwaved by other writers by saying that Galactus hadn't fed off any planets in a while at the time when he was getting Worfed and wasn't at full strength. JLA/Avengers: Krona kills Galactus in a few seconds, and turned into his house. Justified, as Krona is a universe destroyer. Galactus revives after Krona is dispatched, though. Worthy Opponent: Despite their antagonism after the Silver Surfer's rebellion, he deeply respects Norrin Radd for the sacrifice he made for his planet. Especially evident in Silver Surfer: Requiem, where Galactus seems to basically regard himself and the surfer as a father and son who had a fall-out, even comforting the Surfer in his last moments. Wowing Cthulhu: Those who are able to impress him or gain his respect are made his heralds. Silver Surfer is the prime example. Golden Oldie aka Aunt May is another. You Cannot Grasp the True Form: The giant man with a weird helmet you see? That's only how your mind interprets what you are seeing. Every species in the Universe sees him differently because what he really looks like is beyond our understanding. From Fantastic Four V1 #262. Narrator: A million and more alien eyes look upon him who is Galactus, and for each race the vision differs. For Galactus is truly no longer a being in the absolute, physical sense. He is as Odin named him, a force of nature. And each mind that views him struggles as best it can to perceive that unguessable force as an image it can comprehend. Galan is/was humanoid, so the Galactus that we see is perhaps closest to the real deal. Or perhaps we just saw him as a humanoid. You Kill It, You Bought It: In a What If where Uatu killed Galactus himself, he's punished by being forced to take his place.